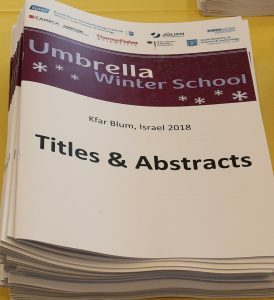 The Technion – Israel Institute of Technology together with two German institutions, RWTH Aachen University, and the Jülich Research Center, collaborated in a joint Umbrella Winter School in Kfar Blum in the North of Israel on December 9-13. The three institutes have been collaborating within the framework of the Umbrella Program for over three decades, to promote scientific exchange and collaboration between Israel and Germany. This year, for the first time, the Umbrella Program hosted together with The Russell Berrie Nanotechnology Institute (RBNI), a Winter School. The five day Winter School focused on material characterization and electron microscopy. 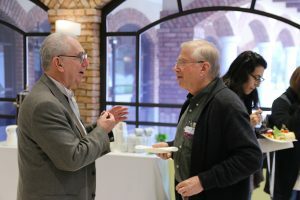 Fourteen world-class lecturers and some 140 graduate students from the three institutions, as well as other universities in Israel and abroad, participated in the event. Prof. Gadi Eisenstein, head of RBNI highlighted in his opening remarks the high level of speakers and the uniqueness of having Israeli students bonding with peers from countries, the world over. Professor Eisenstein announced that in the summer of 2019, a follow-up, “hands-on” school will take place in Jülich, where participants will have the opportunity to experience working with the most advanced microscopy systems in the world. Finally, Professor Eisenstein thanked the Institute staff: Meirav Sondak-Minikes, Pazit Savyon-Maram, and Tanya Ashkenazi, and the organizations that helped finance the event. The opening lecture was presented by Prof. Knut Urban the former head of the Ernst Ruska-Centre for Electron Microscopy and Spectroscopy at the Jülich Research Center and RWTH Aachen University. Today, Professor Urban serves as an active researcher at the center. The Technion Executive Vice President for Research Prof. Wayne Kaplan presented the progress in Energy Dispersive X-ray (EDS) spectroscopy and its advantages in characterizing chemical constituents on surfaces and interfaces between different materials. “EDS detectors receive X-ray signals and convert the energy of each X-ray beam into an electrical signal which is proportional to the energy of the X-ray signal. This makes it possible to identify atoms in materials, and together with high-resolution electron microscopy, the chemical composition of materials can be characterized at atomic resolution,” Kaplan said. Prof. Yeshayahu Talmon of the Wolfson Faculty of Chemical Engineering at the Technion presented developments in Cryo-TEM microscopy of biological materials and other soft materials. “In order to view these materials, we must freeze them, but the freezing process must be done carefully so as to ensure that the crystalline structure that is investigated is not destroyed. Our mission is to understand their nanoscale crystalline structure, and to this end, we use innovative, highly sensitive cameras that allow the monitoring of individual electrons. It is also very important to ensure that the electron beam used in the microscope is of low intensity so that it does not destroy the material,” Talmon said. Prof. Uri Sivan of the Technion’s Physics Department lectured on “The Last Nanometer” – Atomic Force Microscope (AFM) at super high resolutions. Prof. Sivan is an expert in microscopy of surfaces, specifically of liquids, and he combines basic research with biological applications. He and his students construct all their microscopes. In recent years, they have achieved significant improvements in 3D mapping of DNA and other objects at the atomic scale. Prof. Claus Ropers of the University of Göttingen presented the developments in electron microscopy where the electron beam is pulsed and is synchronized to a pulsed laser. Prof. Ropers is one of the leading scientists in this revolutionary field. There are currently only a hand full such systems in the world and the Technion has recently established the only such microscope in Israel. Prof. Thomas Kelly from the University of Wisconsin, a groundbreaking scientist in Atom Probe Tomography, described the latest developments in these microscopes and the enormous potential embodied in their use. Prof. Jean Susini, director of research at the ESRF Center for Electronic Analysis and X-rays in Grenoble, France, described the activities at the center, where researchers from 22 countries participate in some 10,000 experiments per year. Prof. Rafal Dunin-Borkowski, the current director of the Ernst Ruska-Centre surveyed holographic activities in electron microscopes; an area in which he is one of the leading scientists in the world.